Skincare is something very important to me at the moment and everyone wants perfect, flawless skin, right? Being a teenager is very annoying when it comes to skin! I want perfect skin but sadly I am very much prone to blemishes etc. Not great. 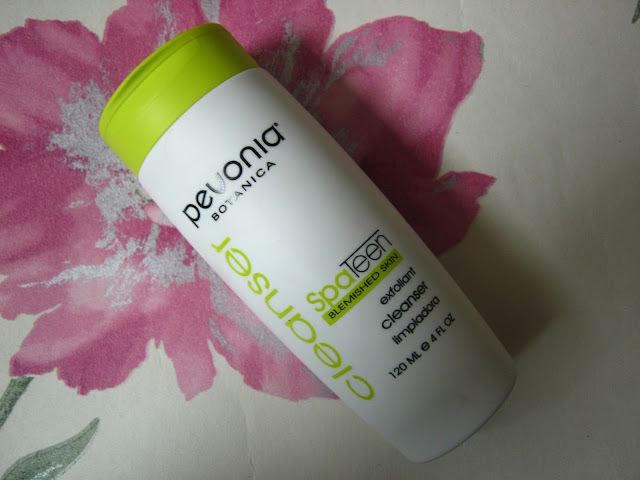 And I always try to find products that can help me with my skin.So recently, I tried some products by a brand called Pevonia Botanica from their spa teen range. A little about them: Pevonia Botanica offers a complete line of spa products that has the finest natural marine and botanical ingredients. These are later combined with technologically advanced formulas and treatments that deliver highly visible results. The ingredients in their natural skin care range are refined in quality and are from the very best sources. Pevonia provides effective natural skincare solutions for women, men, teens, and pre-teens of every skin type and ethnicity. That is amazing! I love this fact about the company. 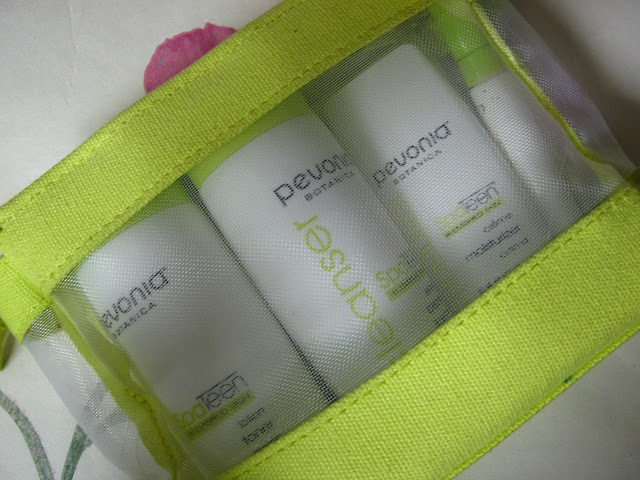 The spa teen line is divided into two: All skin types and Blemished skin type. I'm going to be reviewing the blemished skin type line as I am very prone to breakouts etc. I have been using these for a couple of months and know exactly how they work so this is going to be a very thorough review. 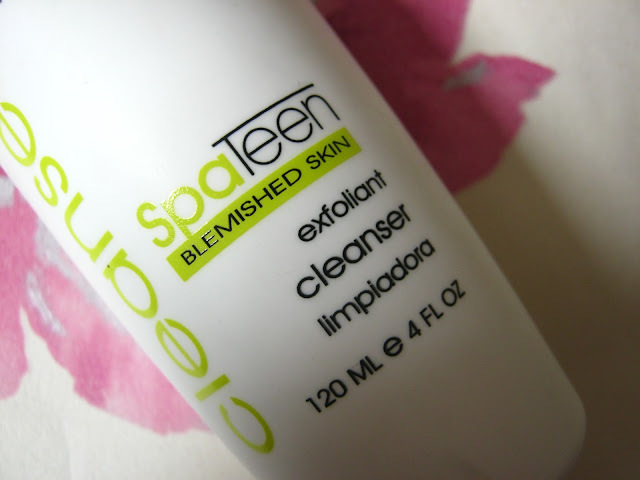 The first product that I have in the pack was the Spa Teen blemished cleanser. I'm just gonna say it straight away without making a story that this by far the best cleanser I have ever used on my skin. The best. You need a very small amount on your palm and just work it in your skin. It has some'beads' in it which exfoliates your skin very nicely. I have been using this in the morning and at night for the past 2 months so it's a very gentle cleanser and can be used on a daily basis. It's quite foamy and removes any impurities and dead skin cells from your skin. My skin feels very smooth, soft and fresh after I have used this. I do feel a big difference in my skin. It's much more clear than before and I have developed a somewhat more toned and even complexion. People have noticed! The smell is very nice in my opinion. The most prominent note I get is citrus as it contains grapefruit and lime oils and I think it's the citrus that stop the oil forming on the skin (sebum control). I definitely recommend this cleanser. I made my mum and sister try it out too and they loved it! It retails at £19.00 (120ml) which is costly but I think it's worth it as alot of people do go for high end skincare anyways. If there was one thing that I would actually re-purchase it would be this product. The second product in the pack that I used after the cleanser was the spa teen blemished skin toner. The toner is alcohol free and contains organic salicylic and lactic acids which adds to a very thorough cleansing process. I usually use this after using the cleanser and it leaves your skin very soft and fresh. The smell to this is exactly the same to the cleanser in my opinion with citrus oil. It also contains vitamin B5 complex which helps to nourish and repair the skin. I think that this toner is a great combination with the cleanser. It really does hydrates your skin and prevents bacteria growth. This also retails at £19.00 (120ml). I would recommend this with the cleanser. Both products act very nicely together. The other product in the pack is the spa teen moisturiser. I have not yet found my perfect moisturiser but this might be it. My skin is very sensitive as well so it's very hard to find something that doesn't burn on my skin or make it go red. This is an amazing moisturiser I gotta say. You seriously need a small amount and it just gets absorbed into your skin very fast. This does not irritate my skin at all. It seems perfect if you have sensitive skin. My sister has tried this too and she loves it. Her skin is extremely sensitive as well. It contains lemon and lime oils, vitamins A, E and C and Kava root extract which is antibacterial and prevents breakouts and heals the skin. I find it to be oil free as well which is another plus point from me. A big recommendation! It retails at £28.00 which even I find it to be very costly. That is the only negative point that I have against this. The last item in the pack was the blemish B-gone tube (12ml)This is also alcohol free and contain ingredients such as witch hazel, horse chestnut extract and sulphur. It is targeted for spot treatments and for immediate healing and preventing further breakouts and hyper- pigmentation. I gotta say the ingredients make it sound very powerful. I use this when I feel I have a blemish coming along or so and leave it on for about 2 mins and let it dry. It would dry out that area or the spot after using it 3-4 times but it's not something that has worked amazingly on my skin like the previous three products. The packaging of this is what I was not happy about. I found it hard to use this as the tube wouldn't open and when it did the product would not come out. 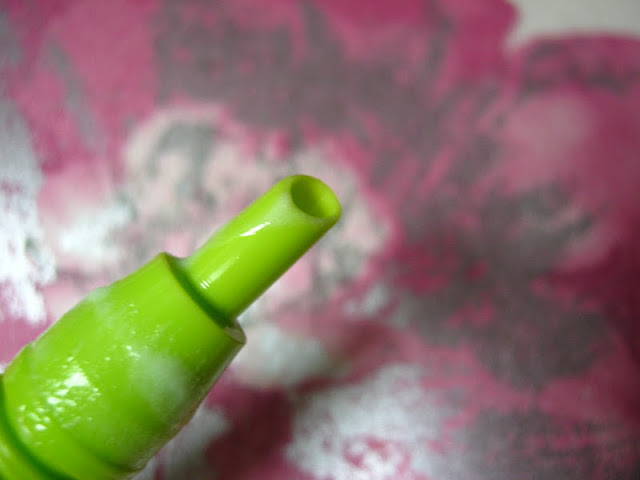 I had put a lot of pressure on the tube and squeeze out the product and that is why the font on it has disappeared. This retails at £21.00. 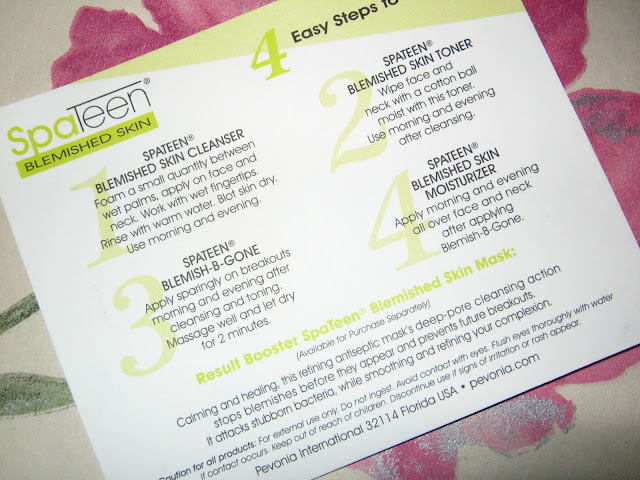 Lastly I also received their spa teen blemished skin mask. This is also lovely. I actually have this on right now haha. Again like alot of these products this also contains lemon and lime oils for sebum control, chamomile flower extract for healing and soothing, camphor bark oil which is a natural astringent, sulphur and kava root extract which is anti bacterial. By using this I have felt the difference between other masks that I have tried out. My skin definitely feels smoother and quite glowy after this. It's also antibacterial which is great. You need to apply a thin layer of this and wash off after 10 minutes. This retails at £21.00. You guys may find the prices of individual products alot so they also have a kit that you can purchase which contain the cleanser, toner, blemish B-gone and the moisturiser for £70.00, which works out to be alot cheaper and in my opinion is the better option and something I would go for myself. The kit is what I have and the products will probably last quite a while. I love the bag the products came in too! In the bag I also got a card with directions which was great too. They also have a spa teen line for normal skin types. These have been great for my skin so far and I really do love these! Especially the cleanser and moisturiser! And I love the packaging of the bottles and the mask and moisturiser.. So simple and sleek and I'm loving the lime green. The product(s) mentioned above is a PR sample but this does not affect my opinion in any way. I have given a 100% honest opinion about the product(s) mentioned above in the post. I think it's good that they've divided their products up in a manner as to make them suitable for each audience, both age and whether they have blemishes. Glad they've worked for you! I suggest you should also try using strimedix. I know you will love that product as well. I haven't heard of the brands but this sounds good. Im glad you love these! This is such a thorough review! Im still on the hunt for my perfect skin regiment!